The send-off this year kicks off at 3.15am on the 10th day of the festival. Despite the unearthly/ungodly hour in which this takes place, the number of people that do turn up cannot be considered small. Having said that, one can see that this event is exclusively attended by those who truly want to send the Emperor Gods off, save for a few gawkers and casual onlookers like me – and the number of clicking cameras drops to just a handful. So bist du meine Tochter nimmermehr...No??? How about...You are sunlight and I moon, joined by...Hah, also wrong??? Then what do you want me to sing then? The opera putting on the final show for the night. The air is quite festive, although the impending departure of the Emperor Gods hangs like a thin veil of melancholy across the temple fair. You could almost hear the deities and dragon carvings on the walls whisper that it will all be over soon. 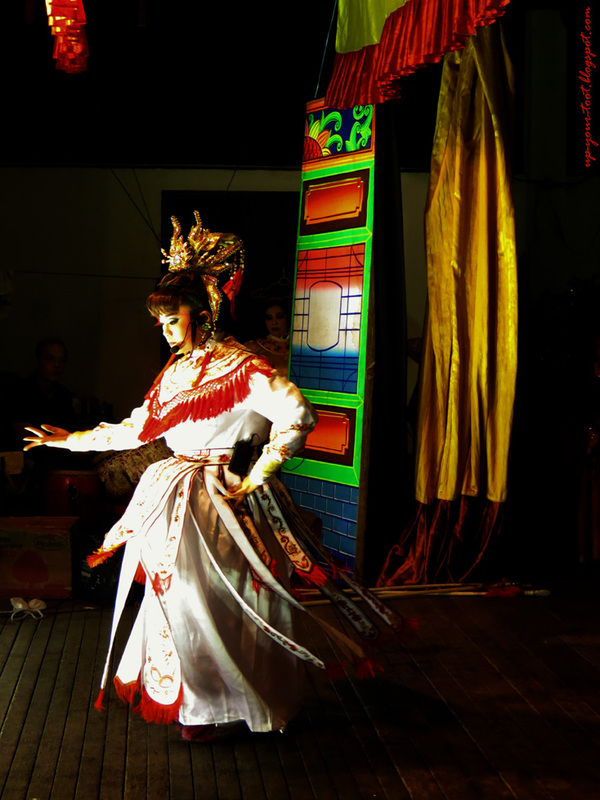 After the confirmation of the send-off time, the opera troupe continues to perform until half an hour or so before the departure time. 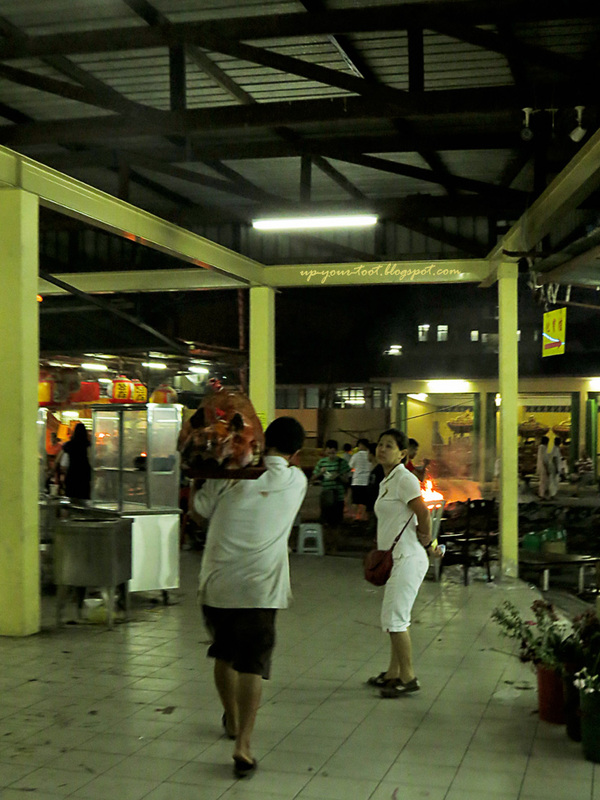 I managed to catch the last bit of the show, together with some of the older devotees who were killing time waiting for the send-off to start. Waiting for the send-off to kick start. Even fellow photographers like Yee Loon had put down his camera. Last minute prayers and the umbrella being given a final adjustments. The atmosphere in here is less smoky now when compared to the other days, or nights. Hmm, what are you staring at? I call him Mr Sour-Face as he always seems to wear a scowl on his face. When asked why he doesn't smile, he replied "How can I smile when I have to work this hard," and proceeded to show me his scarred arms. Contrary to his scowl, he is actually quite a friendly person. 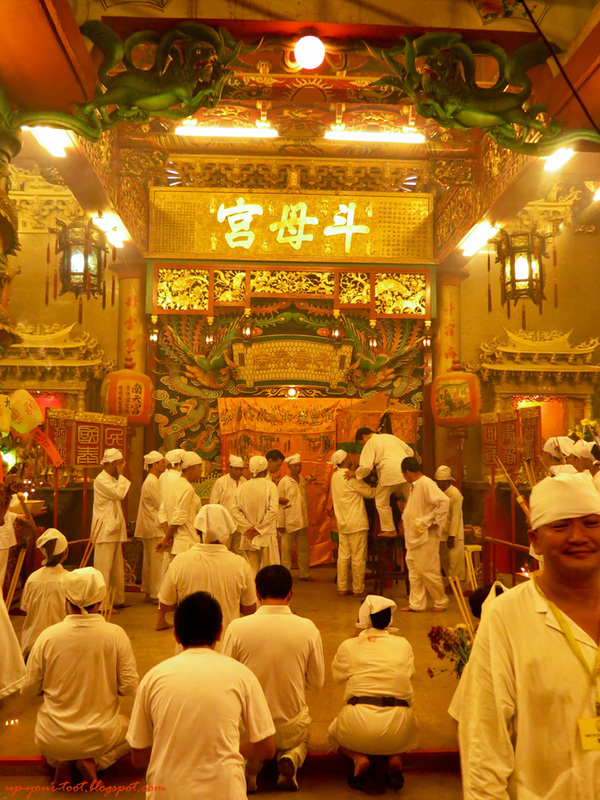 When the show ended, people start to gather around the entrance of the temple and around the main altar. 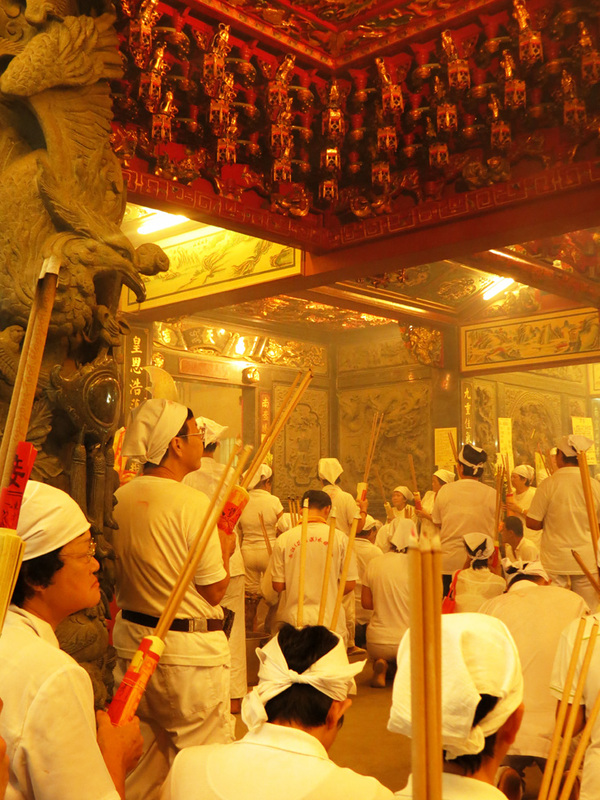 The umbrella for the urn gets a final prepping and with clanging of the bells and joss-sticks being lit, the mediums go into trance to lead the Emperor Gods on their last journey for this year. The mediums waiting for their turn to go into trance. 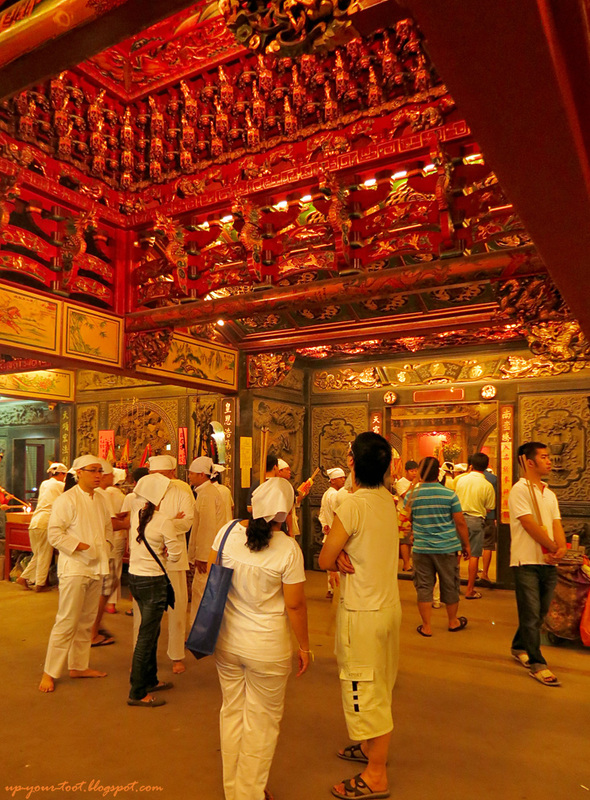 Faithful devotees waiting for the Emperor to emerge from the temple. Round the Old Ampang town the procession goes, and as we turn around the police station back onto the main road, some of the mediums go off their trance. 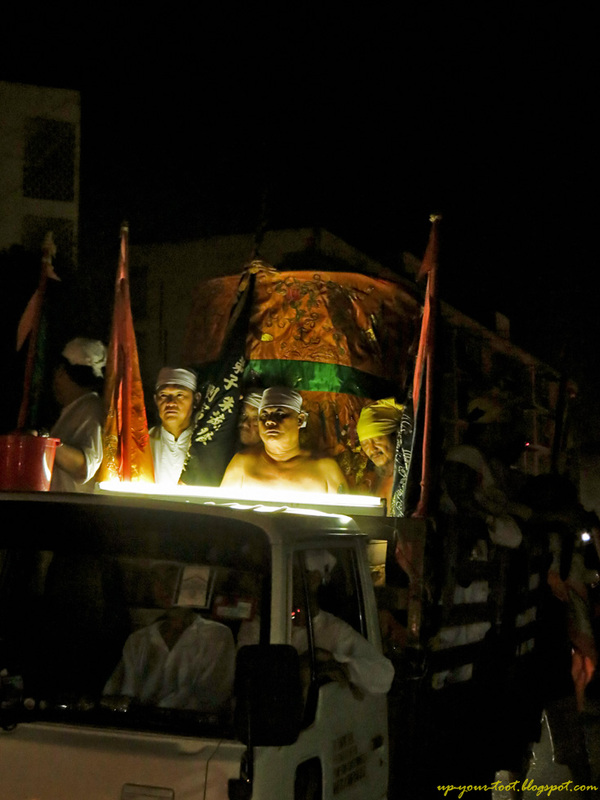 A lorry has been set up further down the road, and the umbrella, urn master and the ‘royal entourage’ gets crammed into this lorry to be transported to the secret location to send the Nine Emperor Gods back to Heaven. 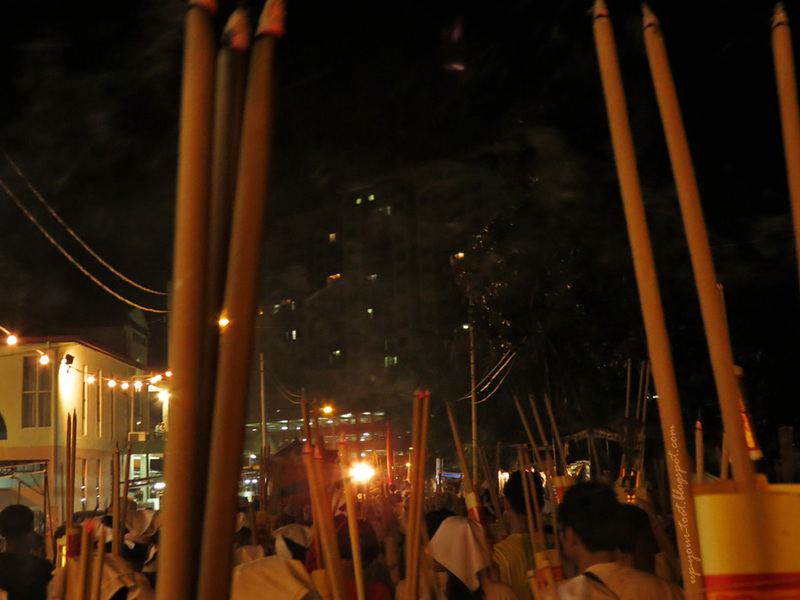 A sea of people in white clothes and joss-sticks flood Jalan Merdeka as the procession leaves the temple. Auf Wiedersehen Nine Emperor Gods, and Cheryl sends her goodbye kisses. The umbrella, urn, medium and the Emperor's entourage about to leave for the airport, err I mean the secret location on a lorry. For the rest of us, we proceeded to walk back to the temple after waving goodbye to the lorry and all aboard. This is the point where devotees who donned the white head-scarf/bandanna would take the white scarf off. 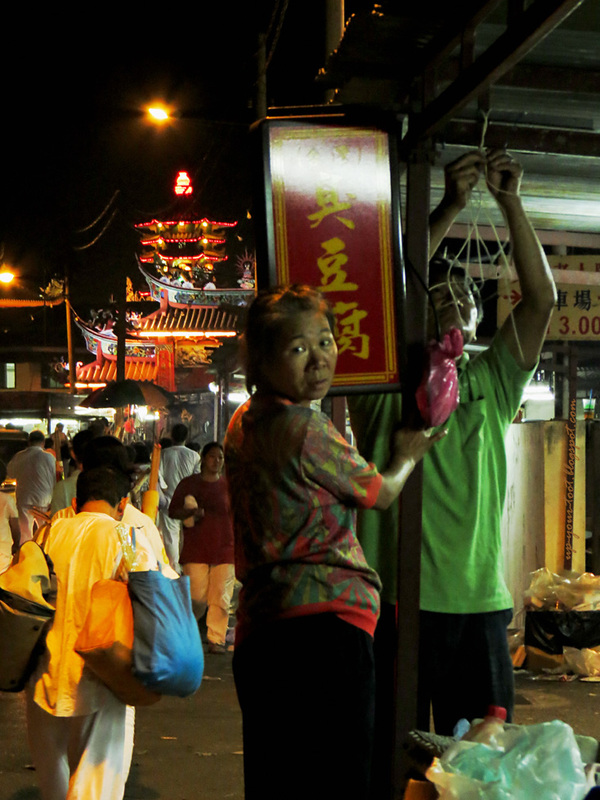 As we walked along Jalan Merdeka back towards the temple, stall owners were busy tearing down their makeshift enterprises that had brisk business for the past nine days. Stinky no more...The stinky tofu stall owner taking down their trademark sign. The last remnants of the Nine Emperor Gods Festival 2012 going up in flames - the joss-sticks and joss paper that was used for the send-off being tossed into the censer at the end of the procession. 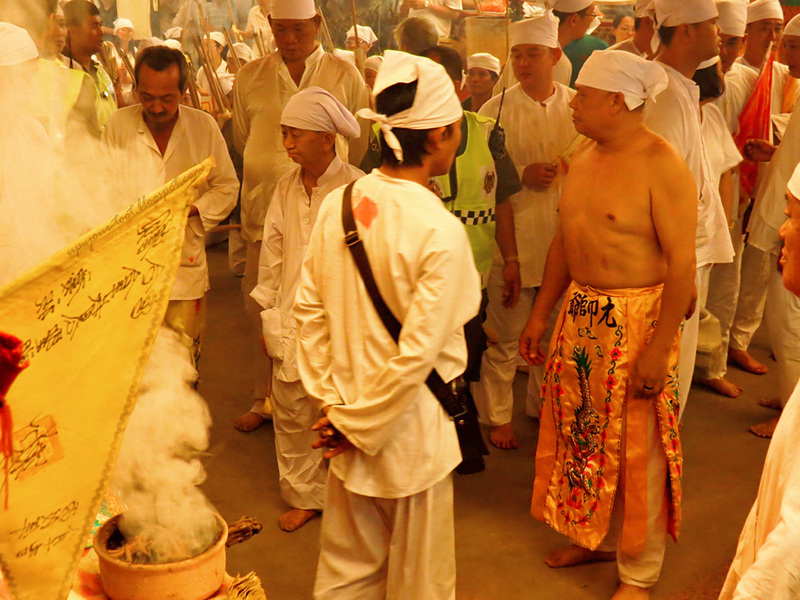 After discarding the joss-sticks and joss paper used for the send-off into the incense paper burner, most of them proceeded to change into bright coloured clothing and offer another set of incense and candles at the temple. 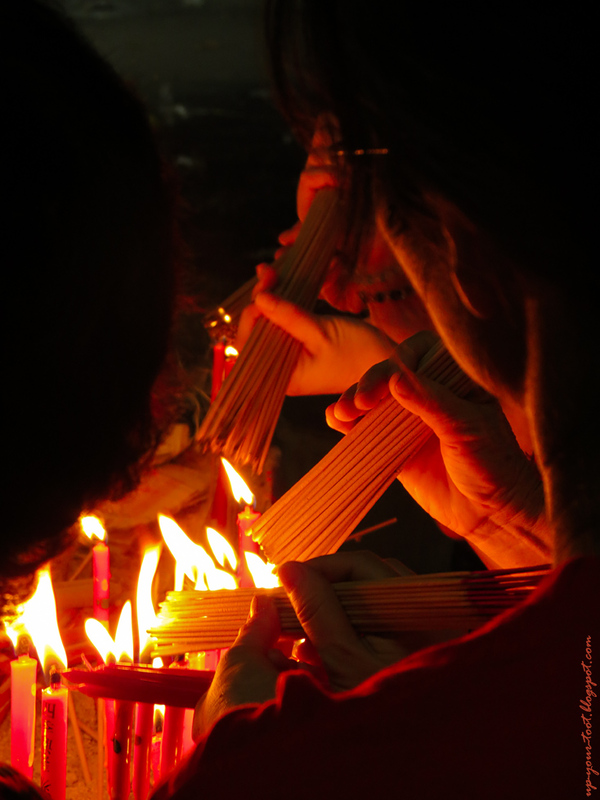 This time the candles are red, and everyone seems to be dressed in red too! Talk about contrast! Also people break their vegetarian fast by eating a meal with meat. I managed to down a bowl of meat porridge with century eggs as I was a little too slow to buy a dumpling (someone bought the whole lot from the seller!). The old, young and..the moustached offering joss-sticks - They are all dressed in different shades of the spectrum except white. Let there be light...red candlelight! RM 5 for a bowl of meat porridge with century eggs. You can add as much sesame seed oil as you like. There is another stall that sells very much the same, except in smaller portion and for RM 3. 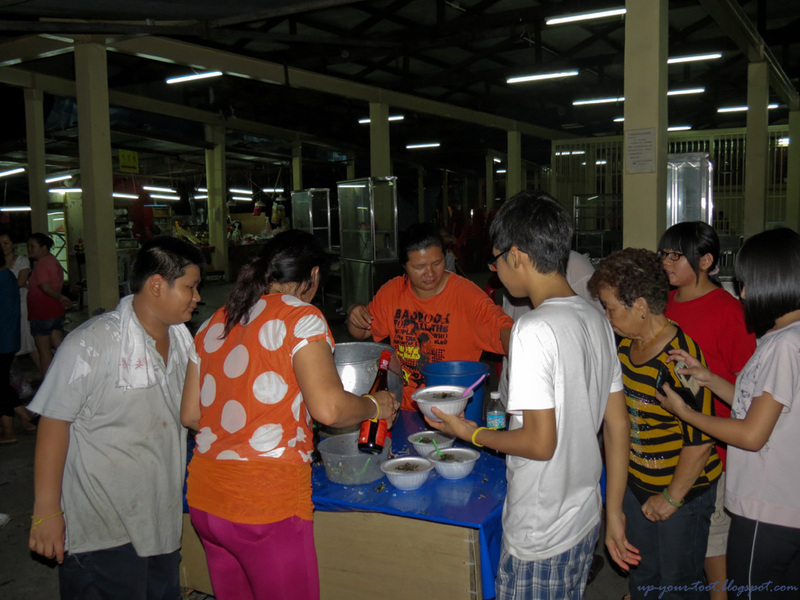 The glutinous dumpling stall had an early sell-out as someone bought the whole lot, I presume for his entire family. 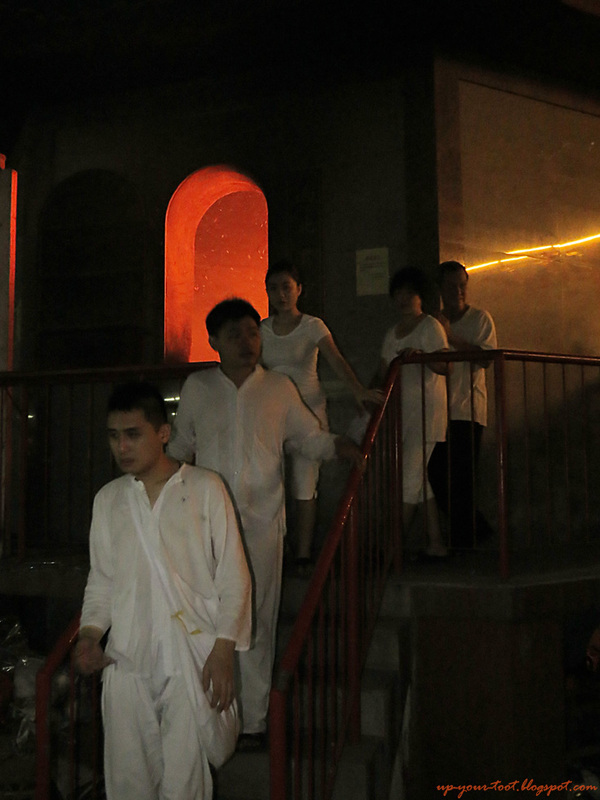 I was about to leave, when I spotted something being carried into the temple – a roasted pig as offering. I decided to follow and see where this little piggy was placed. I discovered that there were two plastic crate-boxes filled with roasted duck and roasted chicken each on the table facing the Finance Minister. 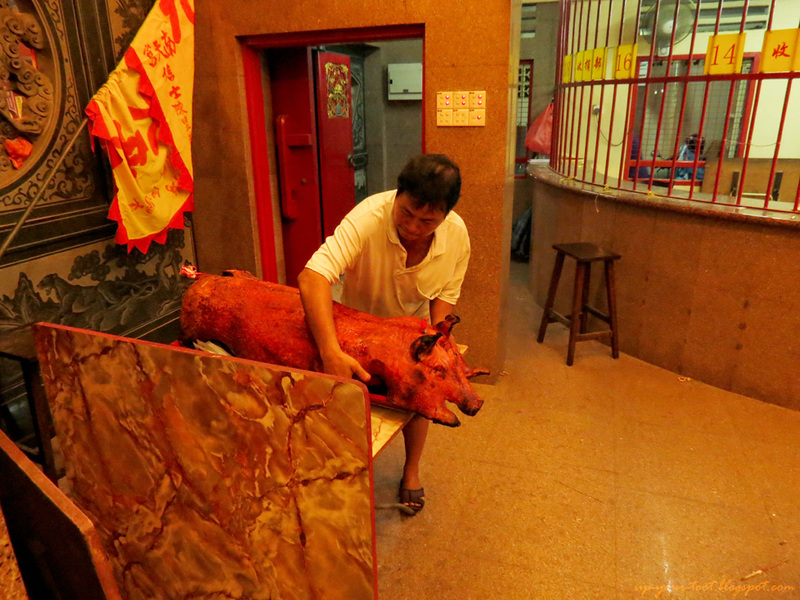 Not only one, but two roast pigs were also brought into the temple. Now this temple for the last 9 days was strictly vegetarian, now you have meat, not only meat but whole roasted animals in here! A great contrast indeed for the celebration. Ei, ei! What do I spy here? This little piggy didn't come back from the market. This little piggy end up at Ampang Nan Tian Gong. 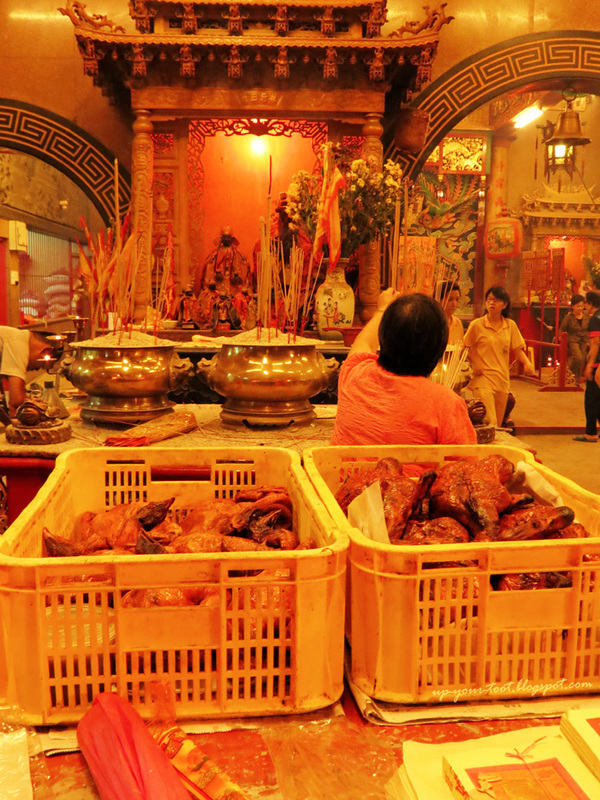 Roasted pigs as offering to the deities after the Nine Emperor Gods have been dispatched off. Decidedly tired and very much needing sleep, I slowly turned towards the exit and started my slow walk back. 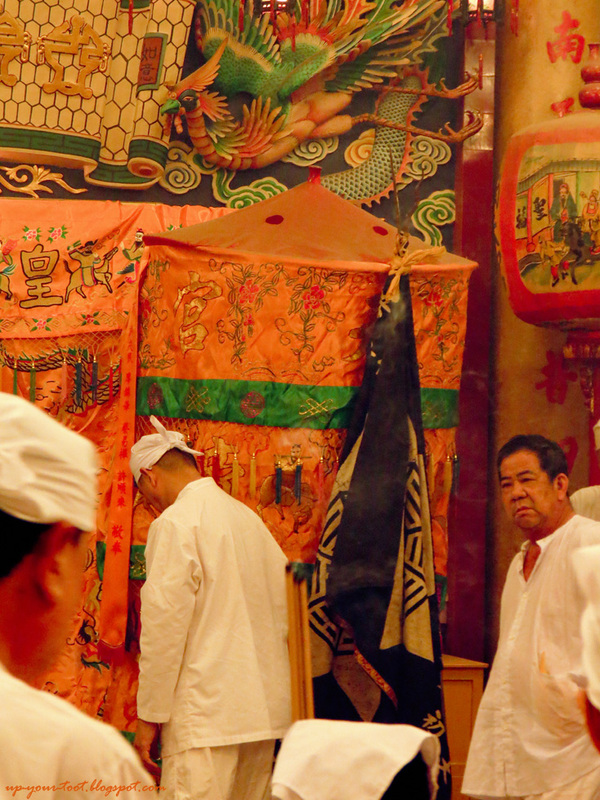 Just as I exited the main temple entrance, a loud commotion caught my attention and what appears to be a scuffle between the stall owners was taking place. Shouts and fists were flying and one of the RELA guys even got his walkie-talkie knocked off when he tried to intervene. As the crowd started to grow, I hastily walked off, not wanting to get involved in any way with it. It is all over now...or is it?? 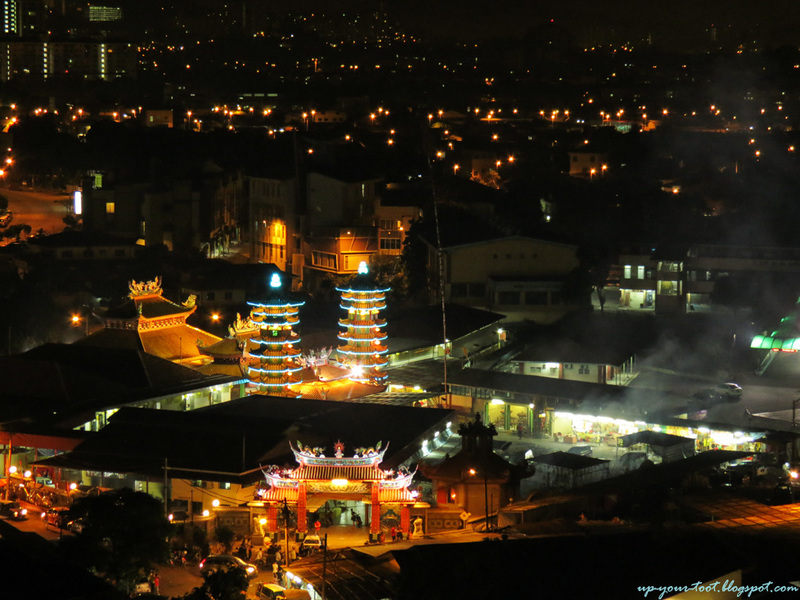 View of Ampang Nan Tian Gong temple after the send-off ceremony. This photo was taken at 4.50am on the 10th day of the festival. 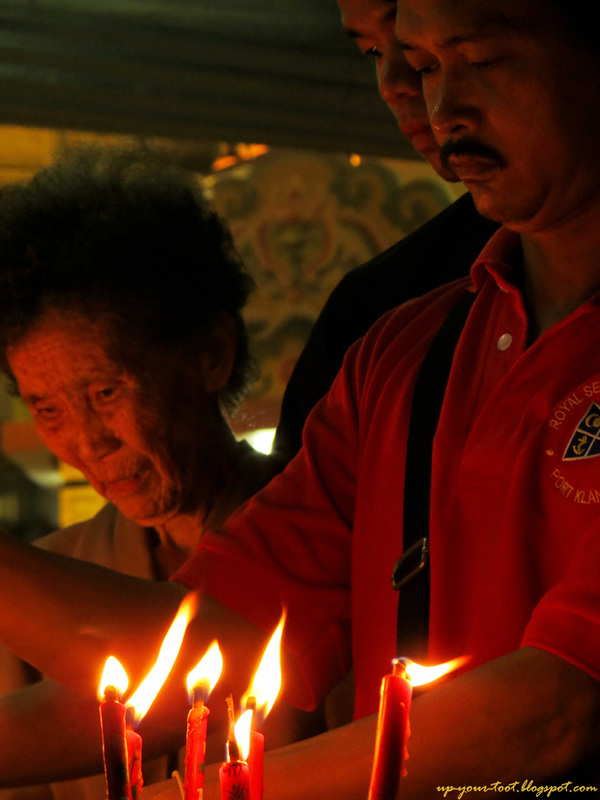 Tomorrow will be another day for me, for it is the day where the lantern-pole gets taken down and the Heavenly Soldiers are dispatched from their guard around the temple. For most people though, the festival is very much over last night.